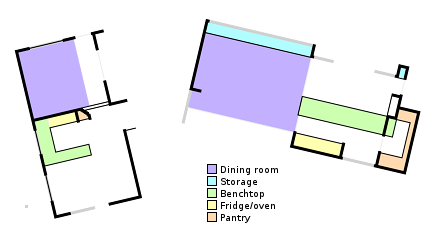 As I alluded to in a previous house update, here are some "before and after" plans of some parts of our new house, compared to similar areas in our current place. First, the master bedroom (include walk-in robes and ensuite). Note the orientation of the rooms have been adjusted so north is to the top in both cases. 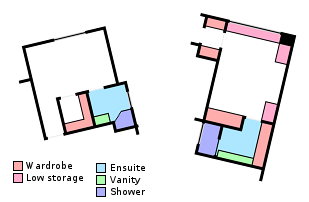 I think you would be hard pressed to find a new house design that doesn't include a walk-in robe - in face many of the pre-designed plans show a WIR and ensuite which combined are bigger than the bedroom itself! Our architect has instead, packed a stack of built-in storage into the area, much more than a WIR could offer! As well as standard built-in robes in both the bedroom itself and the ensuite, there is a walk-through robe on the way in the bedroom (both entrances to the WTR will have cavity slider doors, to allow extra sound insulation and privacy). All of these items will be full-height - making the most of the 2700mm ceilings! There is also a lot of "low joinery" - about 500-600mm high - in the form of built in bedside tables (extra-wide - just enough space to fit a king size bed in between), and a daybed area near the window. The daybed part will probably not be built initially, to allow for a cot and change table to go there - until we don't need them anymore! Speaking of windows, there will be a full height one from the bedroom facing the deck, and another full height one from the shower facing the internal deck. Not sure how that shower window is going to work regarding privacy... there are a few details to be worked out! On to the kitchen/dining/meals areas - yes, these are to scale! This is one of the areas to gain the most in the new house. One of the hardest parts about doing the map above was working out what room was what in our current house to make the comparison! At the moment the dining room is the first room that people walk into when they come in the front door, which is not ideal considering how much mess babies and toddlers make when eating! It also means part of the room is basically a hallway which only makes it smaller. The new dining room is twice as big and also features a length of daybed storage (similar to the master bedroom). It is also physically separated from the kitchen area.. oh the kitchen. If you thought the new pantry looks about the same as the old kitchen - you'd be pretty much right. In fact on the plan above it is pretty hard to spot the old pantry, tucked away there. I've worked out that the volume of our current pantry matches the capacity of the narrow shelf on the eastern wall of the new pantry... and we can't wait! Also notice the windows - almost all north facing to let in the sun. In our old house the kitchen/meals area - which became the de facto living area - is south facing. Two of the other nice things we plan for the new kitchen include an appliance cupboard on the end of the bench, and a child gate, built in to the joinery, at the other end. When the child gate is open it is fully recessed into the bench so you don't even know it is there. The meals area will also have a computer desk at one end - which can be used for children to do homework supervised, as a kitchen recipe computer, or as a TV. So that covers two of the main areas of the house - more to come! In other news, our council plans were approved and in even more exciting news, we will most likely have a builder who can start in January 2011 (given we get all the engineering and detailed plans done by then) which would mean a November 2011 finish! There's a lot to be done before then - I'm currently sorting out my cabling plans (for data/phone/AV/security), which means a lot of researching into home AV distribution as I know next to nothing in that area ... but that's another blog post it itself! This entry was posted on October 4, 2009 at 12:14 pm, and is filed under bedroom, building, house, kitchen . Follow any responses to this post through RSS. You can leave a response, or trackback from your own site. New place looks more & more amazing all the time! Your architect must be a genius, totally blown away by this house so far.